ORIGINAL WAY (Overnight using cold water) Combine flour, yeast, and salt in a medium bowl. Add cold water and combine well. Cover tightly with plastic wrap and let stand on counter top 12 to 18 hours. FASTER WAY (Using hot water) Combine flour, yeast, and salt in a medium bowl. Add hot tap water (120 - 130° F) and combine well. Cover tightly with plastic wrap and let stand on counter top for 3 hours. After the resting time of either the overnight 12-18 hrs or faster 3 hrs, dough will be double in size, puffy & soft, and dotted with bubbles. Sprinkle the dough with a little flour and stir briefly until it forms a ball. Grease a 9 or 10-inch cast iron skillet. Place dough in skillet, spreading close to the edge with oiled fingers. Cover with a pot lid or plate and let rest at least an hour, preferably two. It will continue spreading as it rests. Preheat oven to highest temperature - 500/550° F.
Cook on a stove-top burner on medium-high heat for 3 minutes. Place in oven and bake about 15 minutes (start checking at 12). Note: - Click here for more on making this easy pizza faster using hot water. Note: To reduce moisture when adding sliced mushrooms, peppers, or onions, place them between double paper towels between 2 plates. Microwave 1 minute and press out excess moisture with paper towels. The same process (30 sec. in microwave) removes excess fat from pepperoni. 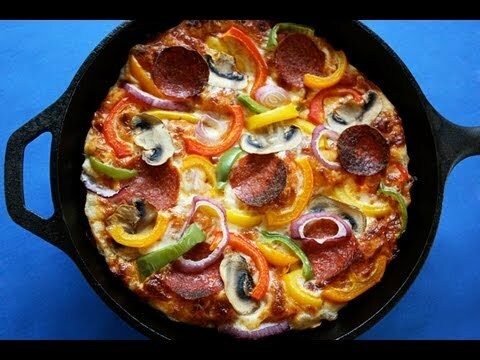 200 Comments on "Easy Pan Pizza"
What brand of cast iron pan is that? Just wanted to say thank you best pizza ever. I did double the recipe I have a cast iron pizza pan from Walmart and it is large enough. I only use the 1/4 yeast and double everything else it’s perfect. I love left over pizza. So needed to make bigger batch. Again thank you for this. So, so easy and delicious. My Italian husband loved this pizza crust! We love your pan pizza recipe. We have made this recipe twice now and each time have had an issue with the crust sticking to the cast iron pan. The second time not as bad as the first. I used 1 tbs. canola oil each time, as that is all I had on hand. Any suggestions, perhaps more oil? Yes, I would definitely try doubling the oil and make sure the entire surface gets oil. I will try your suggestion. Thank you very much for your timely response. Thanks Jenny for a great recipe! My boyfriend was watching an old episode of your cooking show and saw you make this recipe. He was intrigued by the overnight version. I looked it up and made it on February 17, 2019. I used the quicker hot water method. It was super easy! and the pizza was perfect!! Beautiful golden crust but soft and fluffy inside! This will be a go to recipe for us! This pizza is so easy and amazing! Is there anyway that I could make the dough and freeze it after the initial rise and then thaw and let it do the second rise? I have prepared this recipe at least 3 times, and doing it again tonight! Take Out No More! You are quite a character, and I love watching you! Hugs & Kisses to you and your hubby! I made this tonight for supper. The tip on drying out the veggies was full on brilliance. No more take away pizza in our house. Hubby LOVED it! Thanks, Jennie! Although I’m in Calgary (east coast transplant) I was in London only last week. Thanks for sharing your history in pics with us. Who knew, Richmond Street! I just stumbled upon your recipe for easy pan pizza, and can’t wait to try it! Do you have any tips for adapting this to a large pizza stone? I read one entry here that suggested prebaking the dough for a few minutes before applying any sauce or toppings. I modified this by adding 1tbs white sugar and using hot water overnight. I added a few tablespoons of flour in the morning, then gently folded it. I split the dough into two and placed them in spray-oiled pie tins. When I got back from work, they were BEAUTIFUL and risen PERFECTLY! I pre-baked the crust a few minutes so it didn’t deflate when I added the sauce and toppings. I left a little bit of a crust on the edges so I could make it into garlic bread. I would recommend that you use SAF Instant (red package) yeast. This is the yeast that King Arthur uses and recommends. I found this to work way better than any other – especially with this pizza crust recipe. We store the 1lb. yeast in a rubbermaid container in the freezer and it lasts well over a year. See my (modified recipe) note below for having the pizza crust ready when you get home from work! Best pan pizza crust ev iner. This is the best pizza ever, Jenny! Thanks so much. I will never have frozen or pizzaria ever again. I altered a bit for the equipment I have, so sharing to let others know you can still make this awesome recipe even if you need to fudge a bit on equipment. As an example, I don’t have an oven, using toaster oven (Breville smart oven air), 8″ cast iron skillet & no stove ( single induction burner). The full recipe barely fit in 8″ skillet once it puffed up, but was still delicious. I used the 3-hour quick method. The next time, I halved the dough after 3-hour rise & refrigerated 1/2 for 5 days. This was the perfect quantity of dough for 8″ skillet. I used setting 4 on induction burner for 3 minutes, then baked at 480° (highest temp for my toaster oven) , bottom rack position, skillet centered on rack for 12 minutes, turning skillet once halfway through. Perfection! After 5 days, I set the refrigerated dough on counter for 1 hour to reach room temperature, then spread in 8″ greased skillet, covered, for another 1 hour. Dough still felt cold to the touch, but I just proceeded anyway. Heated skillet on induction setting 4 for 3 minutes, baked as before. Perfection again! Jenny, you are right, dough tasted even better after refrigeration. I can’t wait to try freezing the dough after the 3-hour rise for further convenience! It was very kind of you to share all of this with us. Thank you. Pizza turned out just like yours, it is amazing, the crust is too good to be true. I used the quick time, and left it until time to eat. It was a #10, we loved it . Thank you…..love your recipes, have lots to try. I made this pizza last night. It looked like too much to eat, but my husband and I couldn’t get enough of it. I left it on the counter all day till dinnertime and the crust was fantastic. I will never buy store bought pizza again. I never use to eat the crust on pizzas. Now I can. So so good. Thank you Jenny. I modified this recipe a bit and I think many people will REALLY want to know this! Please read! Before that… if you have not tried this recipe – you are missing out… Jenny’s recipe is amazing – try it! So… I wanted a way for the dough to be ready to cook right away when we get home from work, so I modified the “Original” (long) version of the recipe. I simply shortened the first dough rest, and increased the second rest. It worked perfectly! I make the dough with room temp. water at 9-pm. I spread it into the oiled skillet at 6-am. When we get home at 5-pm the pizza is ready for sauce and garnish (as soon as the oven preheats). No waiting 1-2 hours (two is better) before prepping the pizza. This works perfect! FYI… Walmart sells (camping section) Lodge 12″ cast-iron pans with two looped handles for $20. I bought 4 of them for our family, just for this recipe! Thank you Jenny for an AMAZING recipe. This is the only way we make pizza now! It’s so kind of you to share this method (and pan information) with everyone. Thank you! I’m not sure I understand the question but I can say that you can start the dough today because it can rest up to 18 hours. Then tomorrow, you would need another hour or two before putting it in the oven. I hope that helps. How many Carbs in your Pizza? Or by the serving? Thank you so much for sharing your tips. Very helpful preparing on weekday/work days. I have made this pizza several times and each time it has turned out great. My husband loves the crust. I only make a veggie style pizza which is a preference. I have used a 9″” and a 12 “” cast iron pan. Both turned out very well. Thanks for your recipes. I love them. I will never buy pizza again. I have 22″ Weber kettle BBQ that I converted to a pizza oven. It works great for the standard pizza dough cooked on a stone. Using indirect heat with wood, the chamber reaches over 700 degrees.I decided to try it with your Pan Pizza recipe using the cast iron skillets, which is my favorite pizza for my regular oven. For a group I prepared four batches of dough. I prepared 4 cast iron skillets with oil and the dough. At cooking time, I prepared one pan at a time per the recipe. After the 3 min stove top warming, I placed each pizza in the Weber, One by one, they turned out great. The only change from your recipe was adding several more minutes to the baking time and I had to rotate the pan as it baked. Thanks for your great recipes. Thank you for sharing all this, especially your photos. I followed these instructions but used your 20 minute pizza dough and it was delicious. My nieces said it was the best pizza they ever had. I am so excited to have stumbled upon your website!! I am no longer afraid of making dough and baking homemade bread and it is literally all because of your videos. I followed the recipe verbatim though I used a 12 inch skillet (Lodge 10SK). It took a little bit of effort to stretch the dough and mend the little holes, but with that it grew to fill the pan. 12 minutes at 550 and it was excellent, though not quite as crispy through the center. Would definitely make this again. I made it only referencing the YouTube video and came here after. I see there’s a faster method. We have an outdoor 50″ roman style pizza oven that churns out pizza after pizza. But when I want to make pizza in the house the veggies use to sog out the crust, now I use turkey pepperoni and cook some of the moisture out of my peppers, mushrooms, grape tomatoes and artichoke hearts while oven is preheating for about 10 minutes, thanks for the tip! Thank you for sharing this – it’s definitely worth trying. I made this today for dinner. It was awesome. My plan was to take a photo to send to you– but when I took it out of the oven it looked so beautiful and smelled so delicious that I immediately cut it (the sound of the crunch was loud) and gave my husband a slice and to me too. We couldn’t eat it fast enough and forgot to take a picture. Jenny, thank you for making this so easy. I will make this over and over again. This became our family recipe. I don’t order pizza anymore, this is the best pizza I’ve ever eaten. The dough is easy to make and baking it in cast iron makes it delicious. This is our family recipe. I don’t order pizza anymore, this is the best pizza I’ve ever eaten. The dough is easy to make and baked in cast iron makes it delicious. I just wanted to let you know that I’ve made this several times. It is the easiest pizza (pan or otherwise) that I’ve made. No mess, comes out great every time. Our favorite pie joint closed a while back, I’ve spent endless hours trying too make a good pizza. Well let me tell you what, you absolutely nailed the crust!’ So simple and easy. One I changed is the yeast, went to the store and saw pizza yeast. I bit and what the heck, I don’t have to wait a couple of hours. Followed recipe to a tee, guess what, turned out just awesome. Baked at 4000ft elevation at 525 degrees for 12 minutes, thanks Jenny, ever need any tips on smoking just contact me. Great job and thanks for posting. The pizza is delicious, crunchy and everything I expected it to be. It was all gone right after I cut it! I would definitely make it again. Thank you for sharing! I made this in a 12″ skillet and it came out perfect! The initial dough used 180g bread flour and an extra 20g was added 14 hours later, right before putting it in the pan. I’d say 12 minutes at 550 is spot-on. It’s very similar to pizza hut. First off, thanks for the easy recipe! This was my first time making pizza from scratch. I loved how crunchy it came out. Only thing I had an issue was that the crust tasted quite salty to me. Did I do something wrong? Is it okay to reduce the amount of salt put into the dough? Thanks! Yes, you can reduce the salt. What type of salt did you use? 3/4 tsp of table salt is not equal to 3/4 tsp of kosher salt (by weight). I’ve used kosher salt before in recipes and it came out way too salty as kosher is almost twice the weight of table salt, depending on brand. Try again and follow the recipe exactly with no changes whatsoever. This recipe works for just about everyone. Jennie — I live in at 7,00 ft and I’m having a terrible time getting a good “Pizza Dough” when I follow typical recipes — I’ve “thrown out” a half dozen attempts, now. I’m going to try your ‘quick’ recipe ~ any changes I should make for the altitude? I’m sorry, I have no experience with high altitude baking. yes, it is salty….. when i put 2/4 teaspoon i already felt that way. i think 1/4 teaspoon is enough for this small dough. besides that, it is a good recipe and very easy to follow. Has anyone tried using this dough to make breadsticks? what cheeses (type and qty) did you use? garlic or no? In my opinion, 1 1/2 C Flour makes too much dough for a 9 or 10″ skillet your recipe calls for. You could either use a much larger skillet …or, cut the dough recipe down to smaller proportions. Second time around; Just cooked two of your pan pizzas at the same time in the same oven. I used 11 1 /2 ” and 9 1/2″ skillets. Made two batches of your hot water version and used about 1/4 less of the batter for the smaller skillet. Oven at 550′, did the top burner for 3 minutes at med. high, then in the oven. The 11 1/2″ skillet pizza was perfect. The small skillet was a problem. Pizza stuck to the pan and was obviously over-charred on the toppings and cheeses as well. Once I rescued the main part with a steel spatula, we ate that too and it was great. Now, our conclusions. My wife thinks I did the top burners too long. (Went and got a beer!) Although the time was the same, I am guessing the smaller skillet could have required less time. If that make sense, I am guessing the oven would also be less time for the smaller skillet. So, this weekend I’ll be doing the exact thing again and will adjust the timing and I’ll pay closer attention!! My goal is to cook up several pizzas at the same (I have a lot of skillets). I will keep trying and let you know how things work out. Later I will be trying your pan pizza in my pizza oven in my outdoor kitchen. It will crank up to 800+ degrees but is a different environment. I will still be using the skillets. I will let you know the outcome. Thanks for all you do. I am having a good time. What did you figure out regarding cooking multiple pies at once? If we have company over, I’d like to make more than one. This was fantastic. I used the fast version and the crust is soooo good. So easy and the hint about microwaving the veggies before was spot on! Thank you for writing this recipe!!! Thanks for your answers to my earlier comment/questions about your fabulous pan pizza. I am about to launch my own experimental ways of cooking your pan pizza. So far, I have done the 12 hour, cold water method and the 3 hour hot water method. Both perfect. No, better than perfect. I have a large outdoor kitchen with a variety of ways to cook. I will do your recipe exactly as written (both cold and hot water), but in different cooking environments/devices. Each time I do one or two, I will report the result’s with pictures of what I used and any comments. I hope I can contribute to what you offer. It may be helpful and will certainly fulfilling to me. Until later, my sincere thanks for what you do so graciously. I don’t think a toaster oven can get hot enough or have enough room for heat to circulate. But you can always try. I found your videos while searching for recipes for homemade bread and then I couldn’t stop. I’m an academician and started cooking just a year ago. Your recipes sound easy and mouthwatering at the same time. Thank you so much for giving me hope that I too can cook such tasty foods. Tried this recipe and loved it!!!! If I want to make two of theses at the same time, do you adjust cooking times? I have never made two but as long as your oven is big enough for the heat to circulate, I don’t think you would have to adjust the time…. but you will be able to tell by checking them. I have made this wonderful pizza twice and my husband and I love it. I do use the rapid rise yeast let it sit covered in a bowl for 3 hrs. and of course use the warm water. It really does work to cut the vegetables up first and get the moisture out. So just wanted to say thanks for sharing. This was excellent, trying to eat healthy and your recipes are great to make. I’m making your pizza crust for dinner tomorrow. My question is about the yeast…I’m a newbie when it comes to yeast breads. I only have rapid rise yeast. Will that work? Will it take less time to rise? Thanks for your help! Rapid rise is the same as instant. It will work with no changes in the recipe. I hate the idea of heating my oven for an hour to make one small pizza. Do you think I can use my outdoors gas grill? If so, this would be great for the summer so I don’t have a hot kitchen. I have only made this pizza in the oven so I can’t say. Maybe you can look online to see if anyone has done a pizza like this on the grill. I’m not exactly sure what I am doing wrong. (I am a novice at making dough, so forgive me.) When I mix the cold water with the yeast, flour, and salt, it doesn’t really form a ball like in the video. It sort of breaks into small pieces. That looked wrong, but I tried anyway. No good. I let the dough sit for 18 hours (covered), and it looks exactly the same as I left it. No rising or anything. One thing to add — I stirred with a soft plastic spatula. Looks like you were using a hard plastic one in the video. Not sure if that would make a difference. You can stir it with anything – it won’t make a difference. it sounds like you’re using too much flour. What kind of flour are you using and how are you measuring it? You have to aerate all flour before measuring. Look at this link: https://www.jennycancook.com/flour-basics/ What brand/type of yeast? Are you changing anything in my recipe? I’ll report back after attempt #3. Thank you so much for giving the web site to check how to aerate the flour. I tried the hot water and the cold water recipe for the pan pizza, I was still getting a dry crumbly dough. I did not know how to aerate my flour. Thank you, I will try it again. Did you mix the ingredients in a metal dish? If so that is probably where you are having the problem. Metal can inactivate the yeast. At least that is what I’ve been taught. I call BS on steel deactivating yeast. Breweries use stainless steel fermenters without issue. also do you have any suggestions on how to remove the moisture from these types of vegetables, especially tomatoes. We LOVE this pizza. I do have a question though. I take turns cooking for some elderly and Ill friends. If I were to assemble these and then leave the instructions for their family member or friend to cook on the stovetop and then the oven would that work? The pizzas would likely be assembled before cooking/baking possibly up to an hour considering drive time. One family would be closer to 30 mins.. Would the pizza hold up for this and be just as delicious? I’m assuming you have never done this before but am hoping you or/and your readers will have an opinion or some suggestions. Thank you for your help and all your fabulous recipes. The photo looks so good!!! What a great idea to use a cast iron skillet. Wondering if the crust has the yeasty taste of a thin crust pizza or the mild taste of a pan pizza. Will store bought pizza dough work? If so how much would you use? That’s a different kind of dough so I don’t think so. Got this recipe from a good friend and I can’t wait to try it! Doesn’t seem hard at all to make and OMGoodness it look awesome! Hi…I only have a 12″ cast iron pan…will this be ok? I don’t know. Mine is around 10 inches so you can try and see how it turns out. Please let us know if you do. I have a 12inch cast-iron skillet and I have found that I need to reduce the amounts to one cup of flour and half a cup of water to keep it from being too bready. This also eliminates the need to dehydrate the toppings though I do cook the crust first for five minutes after putting a tablespoon of olive oil in the pan first then add my sauce (garlic/ranch) and toppings. Hi Jenny, loved this recipe! Seriously I made it for my wife and I don’t think we will order pizza ever again. I wish I could say for sure but I just don’t know. All the no knead dough recipes I see say up to 18 hours and after that I think they need to be refrigerated. KAF (King Arthur Flour) has a no-knead pizza dough recipe that can be used the same day but the dough actually gets better each day it sits, for up to six days. I’ve used it, it’s excellent. Look up Artisan No-Knead Pizza Dough Recipe/King Arthur Flour. Ok so as promised I made the dough frozen it & here is the Update. I did make it the “quick” cold water way and let it freeze as a ball almost 2 weeks. Defrosted in the fridge overnite & the next day I stretched it in the iron pan and let it sit a few hours. And adorned with vegan yummies as usual. And heated the pan up on the stove before putting in the oven. I found that it came out ok. The crust did have a deflated look, like a think crust whereas when u do it same day, it’s puffy. Extra Bonus reviewers…. so 2 of my 3 cats never care about people food (1 will eat unflavored tofu, so yeah he’s interested in at least tasting everything). When I made the pizza last time my bird torn up the crust, loved it! I had a plate of the crumbs sitting there & the 2 cats not interested in human food STARTED EATING IT!!!! (The 3rd was simply not present). So I did the test with this crust… all 3 cats & my parrot ate it so I would say (as my human palate assessed) it really didn’t impact it taste wise a whole lot. So my verdict? If having it in the freezer on hand makes life easier, do it. It’s not gonna b the best u ever had but sure does work!!! I came across this recipe when trying to learn how to make homemade crust for cast iron pizza. It is fabulous! I had tried dough in a bread maker, and refrigerated dough and this tops all. Thank you. Loved your show, by the way…back in the day. i am planning on making this it looks great, you wouldnt know the calorie in take per person on it. i am trying the weight watchers plan. No, I don’t count calories. Using the amounts listed in the recipe, the pizza is roughly 1200 calories with only cheese as a topping. I did your 20 min pizza dough and am extremely happy that my pizza was ready to be served in a jiffy. Hiw can I do a few dough to freeze up for days when I need to make pizzas. ?? I have no experience with freezing pizza dough so you may have to look around for information on how to do that. Update I did make it the “quick” cold water way and then as my typos wouldnt communicate above, I did not feel like cooking & eating it that nite so i put it in the fridge over nite, let it sit on the counter 9hrs & it was the best crust i have personally made. 2 Blend, i did so in the food processor and as I don’t have bread flour, I used 75% whole wheat 25% white flour. that worked great. I will double the recipe next time and freeze them & let u know how it goes! I can’t see why it wouldn’t come out fine based on all the doughs we freeze & the fact that even the yeast used u can freeze after u open it…. Loved the pizza. I do like sausage but not the store bought. I make my own. I use a pound or even two of turkey meat. Cook it up and make it crumbly then I add these seasonings that are mixed together before hand to the taste I like. I try to cook out all the lique from the meat cooking then I put in ice box the to freezer and only use what I need. I like the way it taste. I feel it is healthier than regular sausage. Hope you like and enjoy it. Thanks for all the wonder videos. Hi, Thank you for this recipe! I’m hoping you can give me advice regarding freezing. Would you know the best method to freeze this pizza? Better to freeze just the dough, or can I freeze with toppings? Uncooked, or partially cooked? I live alone and would love to have pizza available. Thank you again. I’m stuck on this question. I know you can freeze regular pizza dough but I don’t know about this cast iron pan pizza dough. I tried to research but could only find information on regular pizza dough, not the kind that develops slowly like this one. I’m sorry but I am not able to help. Jenny, first off let me say that we love you. My Polish heritage loves you even more. Ok, first of all, we have a grandson who is 6 and he is so picky with all foods. When we have him and our granddaughter or at a family gathering we always have to consider what he would eat. His mom, being a great mom, always says, he’ll eat what we eat. I was that mom too, but now being a grandma I can give him what he likes (haha). He doesn’t like your pizza, he LOVES it. Of course, we only make him cheese and then OF COURSE we have to make other pies with “stuff” on them for the rest of the family. Our daughter has to bring her cast iron skillet with her so we can make more than one pie. We love your pan pizza margharita style or my husbands favorite with pepperoni. He says it’s not pizza without pepperoni. My thought is that in order to taste the pizza it has to be margharita style. This way you can taste the sauce, crust and the simple. Thank you so much for your humor and recipes. You make our day whenever we watch your video’s. We actually have a “dough” rising now for our Italian Saturday night dinner. We make it a rule to always have Italian on Saturdays. Wow, and I’m half Polish. Just wanted to thank you for your pan pizza recipe. We will be serving it at our neighbors Christmas party. We even bought our son a cast iron skillet for Christmas, but don’t tell him, sshhhh. Thanks for sharing “you” with the rest of us. My son sent me your link, I have always enjoyed thin crust pizzas. However after making your recipe I have not made any other crust since! And we make a lot of pizza at our home. This is the best!!! I will need to make two of these to feed my whole family, but I only have one cast iron skillet like the one you used. I do have a cast iron Dutch oven and another cast iron pan that has really low sides (I use for pancakes, tortillas, etc.). Both of them are about the same width size as the regular skillet. Do you think either would work for this? Thanks! I wish I had a perfect answer but I have only made this pizza in a standard skillet. I don’t think either the flat pan (I have one like that too) or the Dutch oven would work for this recipe. The flat pan does not have sides tall enough and the Dutch oven is too deep. If you can invest an a second skillet, that’s the only way you know for sure you can make two at the same time. Is there a preferred position in the oven? Middle, top, or bottom? Always middle unless otherwise specified. Hi Jenny! I love your YouTube video very much. This pizza recipe video is my all time favourite recipe ever. I have a question I am thinking of making this recipe but I don’t have a cast iron skillet but I do have a pizza pan can I use that instated of a cast iron skillet? I don’t think a pizza pan can withstand the direct heat on the burner plus you won’t get that crust without cast iron. I have two cast iron skillets one 8″ and one 5″ would it be best if I split the pizza dough into both cast iron skillets?! I make this recipe in my 8-inch skillet so there is no need to divide the dough. OK NOW …. best pizza ever – I’m not even kidding!!! Thanks for the tip, Jenny! Noticed in one of the comments you’re from Ontario! So am I … I live close to Port Dover! I just made this tonight and it turned out great! lots of fun to watch you on youtube! I can see and hear video on my on my Droid but not while using my home computer. What could be wrong? Take a look at the speaker icon (near the lower left corner of the media player) and make sure the volume has not been muted. If that doesn’t help, you might want to check the general volume settings on your computer. You can try making the whole thing on the stove. Follow my recipe though step 8. Then flip over the dough so the browned part is on the top, add your cheese and toppings, cover the pan, and finish it on the stove until the cheese is melted and toppings are cooked. You may have to reduce the temperature – I don’t know – so keep an eye on it. Also, your cheese will melt okay but make sure your toppings are all at room temperature (not cold) and if they don’t cook enough you can try pre-cooking them before adding to the pizza. Good luck. thank you so much for replyyy it helppedd so muchhh thank you thank you thank you….now i don’t need to worry about my pan or the oven anymoree yeahhhh luvvv yuuu yu hav juz saved my pizza dayyy!!!! It depends how big your skillet is. Mine is 9 inches across the bottom so if yours is 10 or 11, you could probably use the same recipe. If it’s bigger than that you might only have to do one and a half times the dough. I can’t speak from experience but I believe there is no problem with increasing or doubling the recipe. It’s always healthier to use wholemeal flour but I never use it for pizza. I think you would find the the crust too tough and heavy. Jenny, love to watch your YouTube videos, they’re so inspiring. 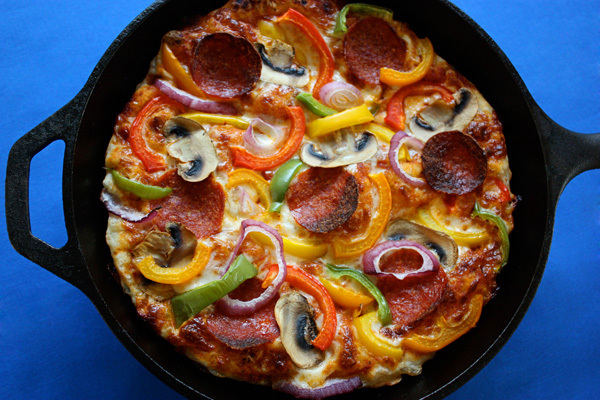 I have a Lodge 14″ cast iron pizza pan which makes phenomenal pizzas and would like to try your pan pizza recipe on this, even though it’s not a skillet. Any suggestions? I made your crispy crust pizza on it last week and it was the best! Thank you! If your pan does not have sides and only a slightly raised rim, I think the dough would spill over the edges, no? But then if it’s 14 inches wide, maybe it will just spread. I don’t know! With an oven that hot, maybe the exposed edges of the crust would burn. I’m sorry, I’m just not sure. I guess you’ll just have to try and if you do, please report back. Thanks. A little off topic, but I was wondering if you could so a short video on how you season a new cast iron skillet? I’ve looked online and on youtube, but everyone does it different. help! thanks, rob. My husband found this recipe an asked me to try it an all i can say is perfecto !!! Did the hot method and used the advice on veggies. This is one great and tasty recipe. Would the pizza recipe work with gluten free flour? No, this recipe as it is will not work with gluten free flour. I suggest that you look for a specific gluten-free recipe because other additions are required. I don’t believe a non-stick pan is advisable for an oven this hot. As far as I know, only cast iron will give you this pizza crust. As for other questions, feel free to ask them in my “Ask/Tell Me Anything” section of my blog. Other people can often benefit from questions, no matter how simple they may seem. I tried your pizza recipe for the first time … I Can’t Believe i ate the whole thing.Yummy ! I did make two of them but one i put in a cake pan and left it in the oven a little longer,Not as crispy on the bottom, but just as good ! This is now made in my house in two skillets each time once a week. One pan for each of us. One with pineapple, ham and mushrooms. The other all meat lots of cheese, peppers and onions. Great crust in this recipe Thank you Jenny you are top gun in all your recipes. I learned to cook as a young boy cold Minnesota winters, one grandma Polish, Another grandma Ukrainian heritage, so watching you cook warms my heart thank you. Wife and I love the pizza recipe Thanks again. been trying to make pizza dough well for years and this one works and is utterly fantastic! it’s great to not have to knead anything. folks, follow this helpful recipe exactly and you’ll be amazed. Thanks Jenny! I just made this tonight and it rivals Pizza Hut Pan Pizza which has always been my favorite. Thank you Jenny for all your time and efforts sharing your great recipes. hey people, made this last night and it was fantastic, I followed the video the only change I made was a little Italian seasoning to the tomato sauce and it was the best pizza, I highly recommend, I wish I had two cast irons skillets cause I would have made two at a time, thanks jenny! I have a 12 inch cast iron pan instead of 10 inch. do you need to adjust the dough recipe to have more flour, yeast and water, etc? THANKS. I would leave the recipe the same. I think it will still fill the pan. This is the best pizza recipe I have ever tried. It becomes a weekly routine for our family to have this pizza for lunch on Saturday or Sunday. Hi Jenny, Made your easy pan pizza. CAN YOU SAY LOVE LOVE LOVE IT. Easiest dough recipe I ever made. My husband loves it. Keep bringing your wonderful recipes. Your crust is great and so easy to put together. I am diabetic, so I use wheat flour all of the time (takes longer to break down into sugars) and I thought I’d try your pizza using wheat flour. Oh Lordy, does your pizza hit the spot. Never thought I could make a pizza dough by just adding yeast to the flour and water. Came out great. Next stop, chicken pot pie or try using your beef stew as a filler. I wanted to check can we use all purpose flour instead of bread flour? and i msure there won’t be any problem if we add ingredients for topping of our choice? All purpose flour is fine to use. Moisture is the enemy of a crispy crust so try to remove some moisture from your toppings first. I usually microwave mu sliced toppings like peppers, onions, mushrooms (especially mushrooms) between paper towels for 30 seconds and then blot with more paper towels. If you don’t microwave, at least blot them before adding. I made this crust last night, it was super easy, and it was perfect. Thanks for this recipe, now I have another one proofing for tonight=). Hi.I am enjoying reading all the comments:).Mine is thus it has to be a cast iron or regular tray will be fine? I think you need cast iron, which can get very hot, to develop that great crispy crust. Is it possible to freeze this dough after letting it set for 18 hours so you can have some on hand to use right away if you need to. At first I wasn’t sure you could but I did some research and it looks like you can freeze it after the overnight rise. Then defrost the dough overnight in the fridge. Once defrosted, allow it to sit at room temperature and once it reaches room temperature, place it in the greased pan and proceed with the recipe from step #3. I have never done this so please report back with your results. Is it ok to use instant yeast instead of active dry? Yes, you can use either yeast for this recipe. Tried the recipe and it turned out great. Glad I saw this for the simple crust. I just bought me a new Lodge 12″ cast iron skillet and this is gonna be the first thing i make in it. Love you Jenny and your recipes. It was a keeper. Thanks Jenny. I am 71 and have been trying to perfect my pizza dough for years and I watched your video on pan pizza, I fell in love with your recipe. Thank you it’s so good. Do I need to adjust for elevation? I am in Albuqueruqe, NM. The elevation is just over 5,000. When I followed the directions the dough was quite rough… How much more water should I add? I have no experience at all with high altitude baking but I did find some good information on thefreshloaf.com about this type of no-knead overnight dough… “The air pressure is lower at 5000 feet so your dough should actually rise faster than it would at sea level. That raises the risk of the dough not developing sufficient structure which, in turn, can cause it to deflate or “collapse”. Watch the dough, not the clock to prevent your dough from over proofing. Some bakers reduce the amount of yeast by as much as 30% – 50% at higher altitudes to get better control over the rise. Also, at higher altitudes the humidity drops (the air is drier) so it’s sometimes necessary to add a bit more water when you bake bread well above sea level. A 60% hydrated dough at sea level might need to be 65% or more at 4000 – 5000 feet.” I hope this is helpful. Hello. First I would like to thank you very much for this website and all your recipes. I love your healthy and tasty cooking. I’m going to bake a pizza and I have a question. 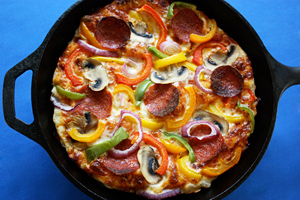 Is it ok to bake a pan pizza using a cast iron grilled pan ( the one with grooves)? Oh, that’s a tough question. My first reaction was that it would not work because parts of the crust would be crispy and part soft. But then I thought that if the dough spreads into the grooves, which it should, maybe it would work. So you might have a crispy, yet bumpy, crust. I wish I could say for sure but I think I would try it. I hope you’ll report back if you try it because this would be good to know for others with a similar pan. Good luck! Either flour will make a good pizza crust. I think bread flour will have a little more body and the a/p flour may be a bit softer but not a huge difference. Thanks. One more question, can I use gluten free flour instead? I have never made gluten free pizza but from what I’ve read I don’t think an overnight dough like this would work without gluten. From the video I would guess I’m using the right size iron – I think. I guess I’ll find out tomorrow! If wrong I just have to increase ingredients by ~1.5x next time. I’m sorry about the confusion. I have two cast iron pans and used them both in the video, 10 and 11-inch. I think your 12-inch will be fine because it’s not much bigger than my 11-inch red one, and there should be enough dough to spread to the edges. Please let me know how it turns out. This pizza was literally outstanding. The dough was light and crunchy and the sauce was the perfect amount. Thank you so much for the great recipe, this one will so be used again! Thank You!!!!! Love your website….making pan pizza today….already got dough rising…. I love all your videos! The recipes never fail!!!! Debbie, thank you for all the compliments. I am from London, Ontario but I’ve never been to B.C…. yet. Like you, I prefer baking over cooking, probably because I love sweets so much. That’s why I’m always coming up with healthy desserts. Thanks for taking time to write.